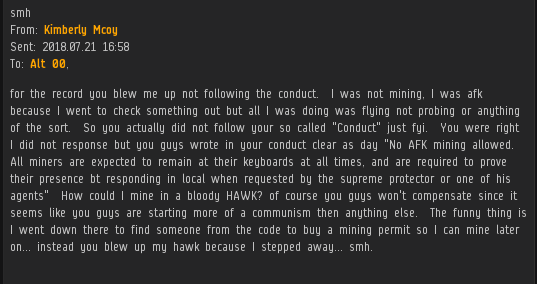 Looks like not much has changed since CCP updated their policy on real-life death threats. Genuine, lasting change comes only through the Code. Welcome to another exciting edition of the Highsec Miner Grab Bag! "They've never ganked me, but I hate them so much that they make me violate the EULA." I believe this technically falls under the New Order Bathroom Protocol. Kimberly Mcoy claims she went AFK "to check something out". At least the other guy was honest. More solid advice from Anti-Ganking. No wonder petitions take so long to get answered. You need a "guarantee" to protect your 10 million isk investment in a permit? I suppose you could ask one of our Agents to sell you permit insurance. Only 10 million isk per permit covered. The anti-Code rebels get more pessimistic by the day. Maybe they should tell carebears to obey the Code so they don't provide us with easy kills and loot drops. Salarion managed to get his permit revoked. Should've bought permit insurance. If you enter a system and wonder who the Agents are, look for the people who demonstrate good sportsmanship. Code violators don't have as much fun playing EVE as those who enforce the Code do. There's a lesson to be learned there. "I'm a defenseless newbie. Also, live in fear of my terrible revenge." Miner logic. People sometimes ask how someone should respond to being ganked, if not with tears and anger. Thanking the ganker is always a good start. Minerva Stormrider thinks most gamers are defenseless...sad! Because someone telling you to die IRL is the same thing as a death threat.... Yeah good luck reporting that retard!